Welcome to this great collection of 100 Number Triangles! These puzzles are an effective way of practicing your addition and subtraction skills. Perfect for educational purposes, Number Triangles are an interactive and visual way of making sum's fun. If you're not familiar with the number triangle, do take a look at the image to the bottom right of the page below. You'll see that the puzzle is composed of three lines that make up the puzzle. There are six shapes along the lines: there are three circles and three squares. The aim of the puzzle is work out the three numbers that must be placed in the squares based on the following simple rule: the numbers in each circle are the sum of the numbers in the two squares at either end of the line. For instance, the 24 in the first circle you see below is the sum of the two numbers in the left corner and right corner squares and so on. As such these puzzles provide an enjoyable solving experience. 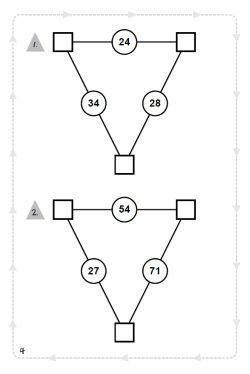 By looking at the puzzle and trying a few numbers, which provides great practice, then it is possible to work out the answer to the puzzle. In the top image below, the values in the squares are 15, 9 and 19 respectively. 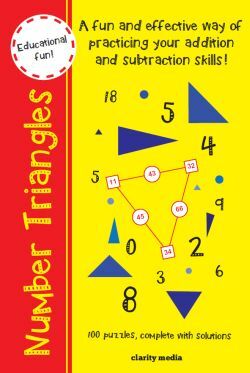 There are 100 number triangle puzzles in this book for you to try. Can you solve them all? Be sure to check your answers against the solutions, towards the back of the book.